Well after a short summer holiday (5 days in France for me, 5 days in the field for him) Dustry and I entered some more combined training at West Wilts EC hoping for a better performance in the show jumping phase than last time. We had a lesson 2 days before and I am still struggling to ride a good corner and straight line to a fence when coming off the right rein (his stiffer rein). We worked on a handy exercise where by you ride the corner to the fence but pass it on a straight line either to the right or left hand side of it, and then every 3rd time ride the corner and jump the fence. This really highlighted our straightness issues so I will be practicing this at home until we have eliminated any wobbliness. 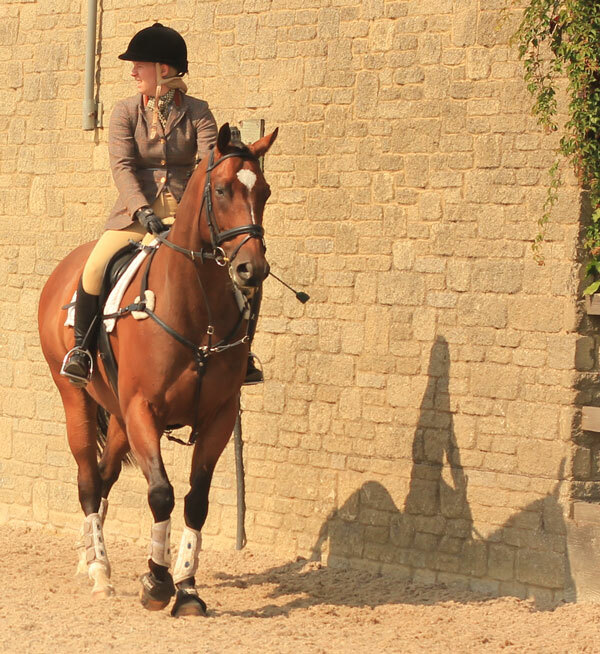 When we got to West Wilts they had changed round the format so that the dressage was in the large outdoor arena and the show jumping was indoors. This wasn’t ideal for us as I was hoping for sjing in the outdoor again where I would have had more time and space throughout the round. Oh well. We warmed up for the dressage and I really needed another 20 minutes and my long whip. D was very distracted by the packed warm up and kept gawking at the xc fences, turned out horses, and wasn’t going forwards as well as he can. An extra 20 mins would have knocked the edge off him and got him concentrating but our time was up and we had to go in. 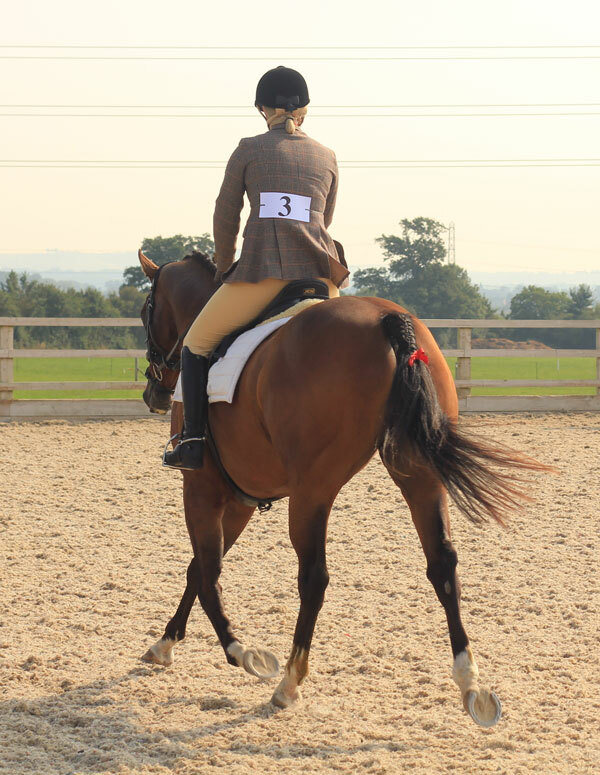 I knew I had to just ride it quietly and tactfully and not ask too much from him as he would get gobby and resistant so I played it safe and having guessed it would be about 62% I wasn’t far off when I looked at the scores and we got 63%. A fair mark and I know the reason behind it so I’m not too worried about that. He coped well performing a test next to another arena which he has only done once before at Area Festivals last year, and he didn’t bat an eye lid at the fake topiary marking the entrance point at A so that was a positive. Next up we warmed up for the jumping. 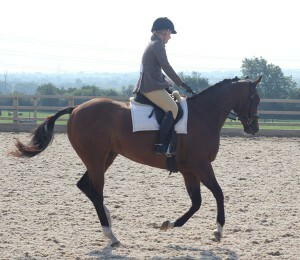 We popped a x pole and an upright and he threw in a stop when presented the first time at the parallel. 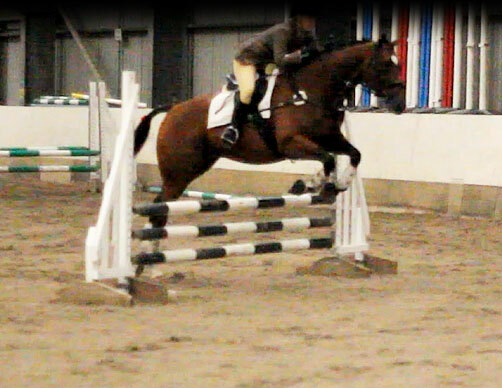 I jumped the upright again a couple of times and praised him, then over the parallel no problem. I still struggle to see a stride every now and again resulting in 1 very deep spot and a bit of a leap! I just need to work on riding him forwards to the fence, but find that really hard in small spaces. Over the parallel a few more times nicely and in we went. I really wanted to just get round without any stops because last time he had run out at a few fences in a horribly ex-racehorse-ish way, head up, neck set, nothing you can do about it. I decided to just trot positively towards the first fence to give him time to asses it, he ballooned it because it was a plastic brush type filler, so obviously it was going to bite his legs off! Ooops look who forgot to do up their chin strap! Trying to repair his way of going between the fences and maintain a good straight approach to each we jumped round fairly cautiously but there was no hint of a stop or a run out so I was really pleased. He just tipped the front pole off the spread at 4 to pick up 4 faults. The last fence we had a bit of a disagreement about as I saw a good slightly long stride so put some leg on, which he didn’t react to enough and so lengthened a little but not enough so chipped in again and jumped himself out of trouble. Not wishing to end on that note I quickly asked the ring steward if I could just pop a single fence again and she said yes so I pointed him at an upright and he jumped it sweetly from a good spot, which was the good note I wanted to end on. Scores all up and our 63% dressage and 1 pole had us in 6th. Yipeeee! He was impeccably behaved all day which was a real bonus as my non-horsey other half came to help me, and was designated with ‘please hold him while I walk the course’ duties needless to say I was relived to come back and find them both in 1 piece! I’ve found jumping comps for us to do every weekend in Sept so we shall be cracking on with that. I’m also going to trial a different bit for the jumping, something to give me more directional control but with a nice soft mouthpiece, my instructor has suggested a Nathe gag so we will look into that. I also have a feeling he may need to go up a gullet size in his saddle so I will be doing some saddle tweaking too….